I just fished this painting out of a pile of old flops that I have been storing forever, knowing that there are problems I have to deal with someday - or just trash it. I had painted a largish figure on the left walking towards me, and a smaller figure crossing the street. I didn't like either of them for a number of reasons. So... time to paint over them and wrestle with 'now what do i do'. The first obvious idea was to cut the panel down to 18x24 now that both focal points are gone. But panels are so hard to cut and... jeez, what a cop out! So I stared at it and thought - ah - a biker! I put one in and now the piece is feeling like it has some potential. The reference looks like it was from 19th street and 6th ave - where the old Bed Bath and Beyond was - or still is? Other than the biker, the city reference is long gone, so I will just keep staring at it, keep wondering 'what do i do now" , try out some ideas, and hope for the best! Lately I am working with old paintings that were started but never finished. In this case I barely got the painting going when apparently life got in the way and it got shuffled to some uncommon place, not to be seen for years. Who knows what reference I was using, a sketch? a photo? whatever, it's gone. It can be freeing to work out of my head when no reference is available, and give myself permission to make fresh decisions about how to make the piece work. I decided to work in a triad color scheme - tried and true red, yellow and blue. 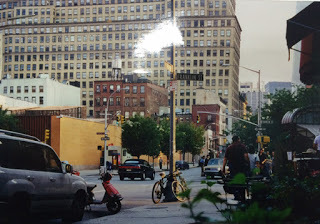 Way back in August of '2000, I sat at Franklin Street in Tribeca, sketching the view, thinking I might do a painting of it. I never did, but recently ran across the photo and sketches (below). I decided to give it a try, and to my surprise the painting took on a colorful life of its own. This cityscape painting depicts a street scene with the usual New York city suspects - tall buildings, pedestrians and taxis. It's painted with energetic brushstrokes of acrylics on canvas and well suited for just about any room if you love bold urban inspired artwork. 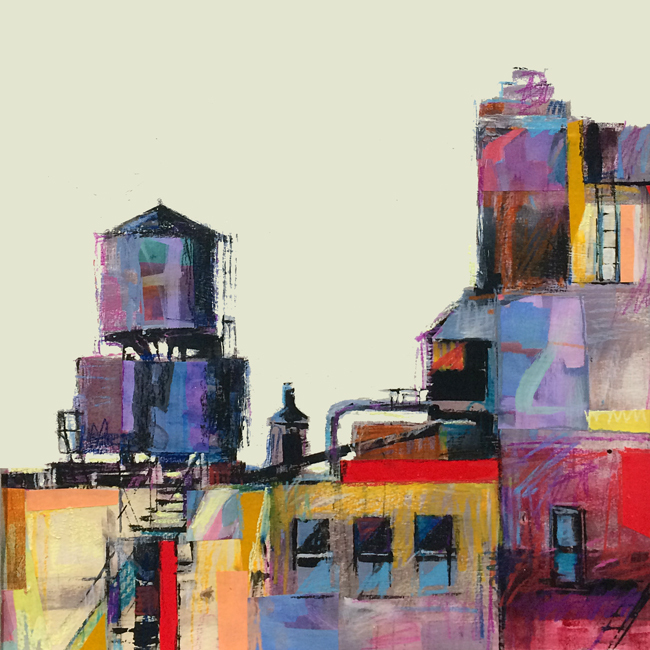 The deep, rich burgundy foreground shadows lead your eye to a scene of lavender gray buildings and butter yellow taxis. "New York State of Mind", Acrylic 8x10"